Are you interested in sharing the healing power of yoga and mindfulness with those who are recovering from trauma? Join us on Friday, September 13th at 1 pm EST for a Google+ Hangout on Air with four veterans who have become Mindful Yoga Therapy instructors. You’ll learn what inspires Chris, Paul, Mike and Ellen to work with returning soldiers, and how a very special training at the Sedona Yoga Festival in February will prepare yoga teachers to work with students who are recovering from post-traumatic stress. Just RSVP “yes,” to this public event to get an email reminder to watch the Hangout in real-time on Give Back Yoga Foundation’s Google+ page or YouTube channel. If you can’t join us at 1 pm, no worries – you can return our page or video channel at a later time to watch a recording of the event. Do you have a question you’d like the veterans to answer during the Hangout? Submit your question through the day of the event by adding a comment to the Veterans on Mindful Yoga Therapy event page. Or, post your question on Give Back Yoga’s Facebook or Twitter page using the hashtag #GBYFonair. We look forward to sharing our hearts and our work with you through this special Hangout. Hope to see you there! 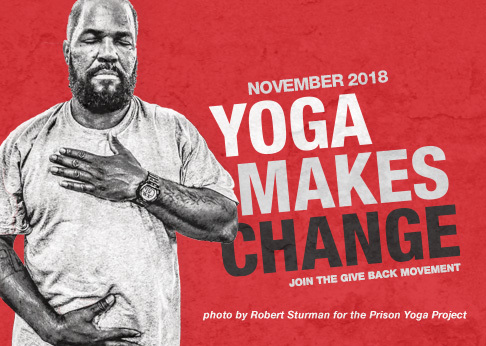 This special event is being hosted in conjunction with Mindful Yoga Therapy for Veterans, a program that offers simple but effective yoga practices that help returning soldiers cope with post-traumatic stress. Click here to read what veterans and yoga teachers are saying about this program. You can support our work with veterans and obtain a valuable tool for dealing with stress by purchasing the multi-media Mindful Yoga Therapy for Veterans Recovering from Trauma guide from our online store. Or purchase a copy on behalf of a veteran in need, by using the “Give a Gift” feature on the right side of this page.